Congratulations To Our Early Admissions Candidates! Wow, what a week it has been for our community here at BASIS Independent Brooklyn! Last Friday we sent out notifications to a record number of students offering them a spot in our program for the 2015-2016 school year. We met such stellar candidates and are so excited to see our vibrant, intellectual community grow in spades next year. Proudly on display in our front office hallway is a map of where of all of our students, families, and staff hail from. 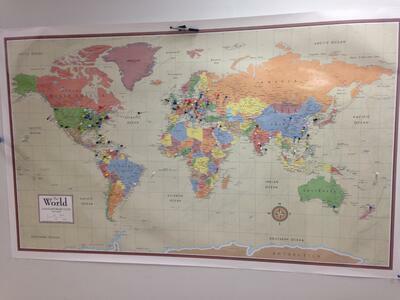 We are looking forward to having our new enrollees add their pins to the map! BASIS Independent Brooklyn is currently accepting Regular Admissions applications for all grades K-9 for the 2015-2016 school year. If you or anyone you know is considering our program, don't delay. There is still time to apply for Regular Admissions, which has a deadline of January 16th, 2015. Once our Regular Admissions deadline passes, we will consider applicants on a rolling basis based on the spots available in that particular grade. Attend one of our upcoming information sessions to learn more about our program or stop by for a tour. A member of our Admissions Team is always happy to answer your questions. Give us a call at 718 643 6302 or email us at admissions@BASISindependentBrooklyn.com.